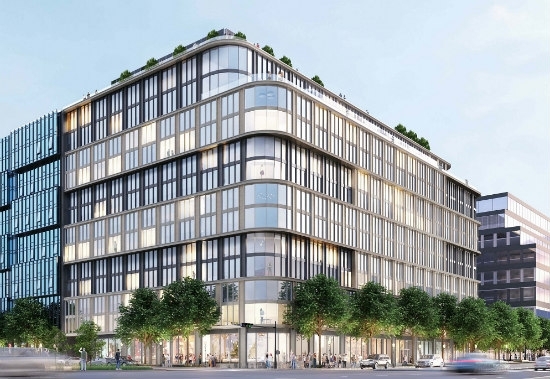 The partnership behind One Hill South, a nearly 400-unit luxury apartment building near Nationals Park, has filed an application to build its sister building next door. Really, it’s not even next door, but rather the second phase of a single building, as described by New York-based The Related Companies Inc. and Ruben Cos., operating as 23 I LLC, in their application for design review. One Hill South, at 909 Half St. SE within the Capitol Riverfront Business Improvement District, delivered this year with 383 units and 22,000 square feet of retail. Phase II, to include roughly 300 units above residential amenity space, will be constructed on the adjacent lot (address: 950 South Capitol St. SE) and connected to the original building to create a single, 13-story 708,801-square-foot structure. The second phase does not include retail, for now, though if the market demands it, the developers will provide it. Designed by Eric Colbert & Associates, the new building will be C-shaped, creating a closed court between it and the backward C-shaped One Hill South. Its design — a mix of stone, metal and glass, tall storefront windows and stone pilasters — “incorporates massing and materials in a manner that helps to advance South Capitol Street as a monumental civic boulevard,” according to the application. The Zoning Commission has not yet scheduled a hearing on the proposal.